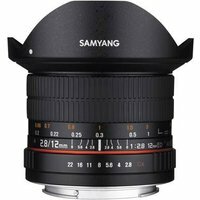 The Samyang 12mm f2.8 ED AS NCS lens is a super-wide fisheye that provides a 180° angle of view on full-frame and a 124.6° on an APS-C Compact System Camera. The lens features highly effective nanocrystal and anti-reflection NCS coating applied together with standard UMC coatings. Thanks to these coatings and a fast aperture of f2.8, the lens can be used as a perfect tool in diverse lighting conditions, as it provides great focus, high contrast and natural colour reproduction even with the aperture wide open. This lens is perfect for landscape, sports, architectural interiors and creative experimentation. Compatible with Sony's full-frame a7 II, a7R II and a7S II compact system cameras.